The first big update of the year is here! The latest update will add a new Gift Plane along with changes to bots, the in-game economy, and balance as well. Also, 1.9.4 will see the return of the fan-favorite War Cache which will allow you to win some great prizes -- keep an eye out for the dedicated article coming within the month. Check out our short review of the incoming update below or jump ahead to the full update notes for a complete look at all the new content! 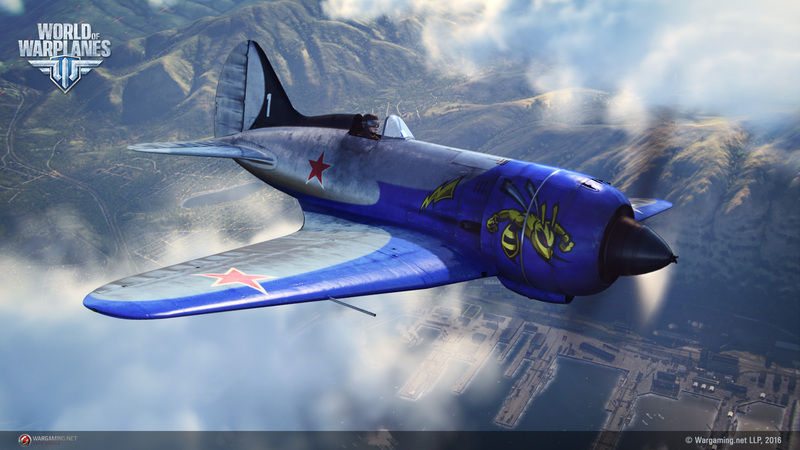 Get ready to earn the Polikarpov I-180-3, a Soviet tier V fighter! I-180-3War Cache Returns! The fan-favorite is back for a third stint (its first in 2016) and brings with it the some great prizes, and an extra-special one that you might get if you strike it lucky. You won't want to miss the dedicated article for the return of this event, so keep your eyes peeled! Bugfix for incorrect superiority points being counted when the central part of complex ground target is destroyed with a bomb or rocket. New icon showing daily mission progress for each difficulty level added to the Hangar. Tooltip showing daily mission description and award redesigned. Award for completing daily missions with aircraft of all tiers changed -- it now depends on the mission difficulty and ranges from 1 to 3 Tokens. Aircraft tier range for the "National Park" map changed to be available for tier V–X aircraft. Spitfire V DB 605: Durability slightly increased; maneuverability increased; acceleration and speed at maximum continuous power increased; optimum speed decreased. Fw 189 C Eule, Ju 87 G Eule, Me 265, Me 329, Me P.1099 B-2: improved rear gun performance increased. P-51D Mustang: Weapon accuracy increased; yaw maneuverability slightly increased. XP-75 Eagle: Maneuverability increased; acceleration when boosting increased and acceleration without boosting slightly decreased; stall speed decreased; optimum speed decreased. P-51H: Weapon accuracy increased; MG-53HB machine gun damage increased; yaw maneuverability slightly increased. XF5U Pancake: MG-53HB machine gun damage increased. XP-72: MG-53HB machine gun damage increased. FJ-1 Fury: Weapon accuracy increased; MG-53HB machine gun damage increased; yaw maneuverability slightly increased. F-84B Thunderjet: Weapon accuracy increased; MG-53HB machine gun damage increased; yaw maneuverability slightly increased. F-86A Sabre: Weapon accuracy increased; yaw maneuverability slightly increased. F-84F Thunderstreak: Weapon accuracy increased. Skua, Blenheim F: Improved rear guns performance increased. J4M Senden: Accuracy and cooldown speed of 20 mm Type 99-2 Model 5 autocannon increased. J7W1 Shinden: Accuracy of 30 mm autocannon increased, speed maintaining improved; controllability at low speeds improved; stall speed decreased. J7W2 Shinden-Kai: Durability increased; accuracy of 30 mm Type 5 and Type 17 autocannon increased; speed maintaining improved; controllability at low speeds and when diving improved; stall speed decreased; engine cooldown speed increased. J7W3: Durability increased; accuracy and burst before overheating of 30 mm Type 17 autocannon increased; dive speed increased; speed maintaining improved; controllability at low speeds and when diving improved; stall speed decreased; engine cooldown speed increased. More options to earn and spend Tokens added. Tokens can be earned not only for fulfilling all conditions of the daily missions, and also for receiving achievements from Service Award and Epic Achievement categories. An award for receiving each of these achievements is added to your account once per day. Option to buy a 30-day long Premium Account for 150 Tokens added. Price for purchasing a slot in Hangar changed to 18 Tokens. Option to sell the 2014–2015 holiday season consumables (Sparklers, Smoke Flare, and Fireworks). Reaction of bots to chat shortcuts added. Players can affect the behavior of bots: a player can ask for support when attacking a target (command "Coordinated Attack on <target name>! ", prevent a bot from attacking a target (command "Engaging <target name>! ", or ask for cover and support (commands "Cover Me!" and "Clear My Tail!". A bot that receives a command sends a confirmation to the player. The confirmation is also displayed as an icon next to the marker in the battle interface. If a bot cannot carry out the command, it sends a refuse message to the player in the chat. Bots that fly attack aircraft do not perform evasive maneuvers any more when firing at a ground target. Bots that fly attack aircraft will maintain their altitude to avoid collisions with trees when attacking ground targets. Bots with the "Warrior" and "Veteran" skill levels will avoid head-on attacks with a superior enemy. Bots with the Warrior and "Veteran" skill levels will engage in maneuvering combats more often. If no enemies are spotted on the map, bots will descend and fly to the map sector where an allied ground target has been attacked. Ability of bots to do a barrel roll in any direction improved. New bot messages for the chat added. New bot names for Chinese aircraft added. Firing sounds of rear guns improved. Rear guns of different calibers now produce different firing sounds. Graphic effects for shots hitting the ground and explosions in the water optimized. Graphic effects for jet exhaust changed: jet engines of different tiers produce different exhaust effects. In the sound settings, an option to select the preset profiles for different audio devices added.